There are so many joys in being a mother. The moment I held my baby in my hands, I felt that I was blessed. The enormous feeling of love that you feel in your heart as you hold the tiny, gentle hands in yours, the swell of love that engulfs you as you watch your little one sleeping peacefully next to you – and that special bond that you feel as you breastfeed her – there is no other gift in life that makes you feel that way. The excitement of all gifts big or small dies down overtime. But in being a mother? The moment of joy stays with you forever. Despite the occasional feelings that she is going to drive you mad because you can’t keep up with the energy and curiosity of a child. While a child is always looking for something, putting a finger in a hole there, or pressing a button here, she is always exploring and learning; she is making sense of the world that she is in. But because she has this excitement and zeal to see more and to know more, the mother has to have a big heart. A really big heart. Because you are a mother and a child at this age (1-2 years) cannot be controlled by reasoning, you are in a dilemma of what you should do. There are social gatherings that you cannot forego because you are a mother. Besides, you feel that the way to let a child grow up is not by closing the rest of the world out. The way to let the child see the world is to live as naturally as possible – letting the things around us run as they usually do; and letting ourselves go around life as usual. Except, at times it gets really, really difficult. There were many times when I felt torn that I had not taken her into account when I made a decision to take part in something. When you are at someone’s house as a guest, you are ill at ease – having to follow your child and keeping an eye to make sure that she is not breaking something, or spilling something on the carpet. But despite all this I-wish-I-were-not-part-of-this-gathering feeling, we have to be a part of it. I can’t explain why I must torture myself and my baby that way – but I have always taken part as I would if I were not a mother. And the expense of it all is that, after a while she gets tired and agitated. Her sleep time gets disturbed. And then, I blame myself for not being a good mother. For example, today we were at the Victoria Market in Melboune (it is an open market like the one we have in Bhutan). While my husband and other friends shopped, we played at the nearby park. I decided to do that because I thought I had to consider her first. When I knew she had had enough time at the park and was getting sleepy, we joined the others. But she got sleepy and yet she could not sleep. She got so agitated. She did not want to stay on the stroller. She was pushing herself out from the straps with so much strength that she was almost out of them. So I took her out thinking that we were almost done at the market and she deserved to be out too. But the moment she was out, she ran around the shop, touching things here and there. And then, she slipped and hit her forehead so hard on the concrete floor and got a very bad big swelling on her left forehead. People around were shocked and aghast. I felt so bad. On top of that feeling, I was blamed. My husband’s hysterical remark was that, I simply don’t know how to look after a child. This is how it is. Despite all your effort to be a good mother, despite all the love that you feel, you fail somehow. There is always something that you don’t get right. For me, I can only soothe myself by crying with her and blaming myself. Then I make a decision that I will lock ourselves in and not join the others. This time, I am almost sure that I will not go shopping or attend a social gathering out of an obligation to not hurt the sentiments of others. There are already three appointments of such obligations and I am wondering how best to take back my words. It is so difficult to live when you are a person who has to keep the word that you have given. I have put myself on torture many a times because of this principle that I must stick to. This time, for my daughter, I may break it. For me, it is she that matters the most. I must have a big heart. I don’t remember when was the last time I felt so euphoric and relieved to have achieved something. I probably did when I finished my engineering degree, but I don’t remember it now. This time, when I finished my masters in IT, I had a sense of relief run over me as if it was what I always wanted and I now had it in my grips for the rest of my life. I think the sense of achievement and relief is more today because I am a wife and a mother and the commitment and discipline required to shoulder the responsibility as a student more than tripled – and I am proud today for having made it without any major obstacle. While I felt it like a big challenge in the beginning, I was happy that I could now sort out my time and priority and was surer about how much time I should dedicate to each of the obligations. My family received my first priority and I am glad that is how it was. They dedicatedly stood beside me and this is what they deserve. In fact, they deserve much more. And it is in fact sad that I can only thank them. But what better way than to genuinely feel the gratitude, right? So as I stand here today, having achieved one important milestone in my life, I thank my husband and daughter from the bottom of my heart. Without them, it would have been impossible to even dream. I was sorry that he had to go through the troubles of looking after our five month old daughter who could be soothed only by breastfeeding for 8 hours at a time sometimes. But he has in his nature to do the things he does in the best way. And even when it came to parenting, he did it in the finest way. As I look back to 18 months before, I see them going for walks almost every day, our little daughter sometimes falling asleep in the pram, he singing lullaby and rhythmically soothing the gentle ears. 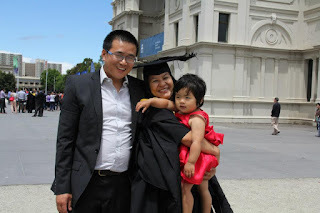 As a top undergraduate engineering student delivered the valedictory speech at the graduation ceremony and thanked his parents and friends, tears welled up in my eyes – my daughter and husband, the two most beautiful people in my life stood in my mind and I recollected all the days of sacrifices they had to make to suit my class schedules and assignment due dates. Without this flexibility and compromise, I would not be standing here today. I think in life, what you achieve and how far you walk depend on your partner and his support. I am glad I have one who knows my heart and my ability, and believes in me. (Thank you Honey. You complete me.) Likewise, I promise that I will stand by you and our daughter throughout my life. I did not have to go to a boarding school right from prep. But I had to stay with my brother, whose house was closer to the school. By nine I was separated from my parents and I had to learn that growing up meant learning to adapt to changes. But surprisingly, I could never come to get used to it. No matter how much further I went from home, how much longer I was separated from them – I missed them and cried all the same. Now I am a mother. But I miss my mother all the same. I am child to her all the same – with shortcomings and craving for her love. But the difference is that, now, I know what it is like to be a mother: how much heartaches she has to go through, how much tears she has to shed and how many difficult decisions she has to make. Life has never a clear cut answer for you. You have to decide on your own. This is to say that when you are a mother, you are torn by the things you have to do that make yourself and your child cry – all because the nature of way things works in life is that no two persons can stay together all the time. Or else, you have to go hungry. This we can choose too, if we want to beg and not fend for ourselves. My baby got sick and she could not go to her childcare centre for a week. When I took her back, she cried and clung on me. This is the third week after she got sick that she is going to school but she still hasn't gotten over it yet. The last time I took her, she clung on me and when a staff tried to take her, she caught on my jacket with all her strength – giving a very strong pull. This morning, as soon as we reached in front of her childcare, she kept saying, ‘no,no’ and more ‘no, no’. She didn't want to go in. When I went to open the outer gate, she stuck her feet on the gate and wouldn't move with me. I had to close the gate and sit with her outside to console her, to coax her and tell her that it was OK. She took my hand and was walking towards home. I had to tell her that school is a good place to be – because there are so many friends and toys. We used to sing the song, ‘School is a place I like to go because I can play with my friends and I can play many toys.’ But it doesn't work anymore. When we were struggling through this, a staff came by. She said to me, ‘You have to show that you are in control, not her.’ I said, ‘it is difficult.’ She did say that she understood it because she had been through it. But I wonder if it is really that difficult for them, taking into account the different cultures. For example, in their culture babies don’t sleep with their parents. They not only got a separate bed but they have a separate room. The thought itself is scary to me. I can’t leave my baby alone in a different room. I might be wrong, but from what I have observed, they don’t demonstrate so much love for babies. They are strict in what should and should not be done – even for babies. I grew up pampered and it doesn't matter if my baby has to grow up pampered. She will find her way and she will know what is good and bad as I did. But coincidentally just when she was sick, one staff left the centre. That staff was the friendliest – in the sense that she was a young jovial lady who knew how to attend to babies. All babies loved her. I noticed that she was always carrying and cuddling a baby. Childcare staff usually don’t cuddle babies so much. They let them play and watch them play, to make sure that they are not fighting or falling down. But this lady was different. And my baby loved her. She would extend her arms out and my baby would go to her as she does to me. Also a week back, I saw that someone scratched her leg. There was fresh, pink mark from the nails. It went away in two days but I informed the staff. I am wondering if something is happening that is making her not want to go to school. They tell me that it is just that she is clingy to me but she usually has very good day. But no matter how good a day she has there, when it comes to making a choice, she would rather be with me. I feel sad that she should learn to adapt from an age as young as this. I hate the fact that growth has to be so painful. She will forget all this I know, but as a mother, it is so painful. And I have to shed tears all the time I have to drop her and come back. I can only console that come November 21st and my exam will be done. If we want to stay at the park all day, we will. It was 10:30 am and I was returning home after dropping my baby at the childcare. Two meters away from the centre, I met an old man…a westerner by his looks, but not an Australian by the way he spoke English. He smiled at me and said something like, ‘your baby was crying…but now he…(stammers, then hmmms and says) she is ok now.’ Then he asked, ‘daughter or son?’ I am taken aback for a second. I was like, ‘what is he saying?’ So I then asked him, ‘You mean you heard my daughter cry?’ He said, he stays next to the childcare centre where my daughter goes. He must have seen us many times, walking past his house to the childcare centre. He asked me if it is just me and my daughter or if I have any other family members with us. I told him that I have my husband and three cousins. And his next question threw me away in confusion. The full effect and understanding of his proposal of whether I was in need of a company didn’t register until I walked away from him. I said, ‘no’ and he walked away saying, ‘that is all right. See you.’ I appreciated his outright straightforwardness and how he could immediately understand what a ‘no’ meant. But of course he didn’t grow old not knowing what it all means to linger too long after someone whose answer was a ‘no’. I walked away, laughing. I honestly couldn’t control myself. I was crossing the roads and I was smiling…so broadly. Now, this didn’t mean I was making fun of him. It was kind of unbelievable to me. I have never known people to speak something like this so openly and in the clearest words, without any umm and ahh and in the longest winding about way. That probably is how Bhutanese make a proposal. And then I wondered what part of the sentence where I mentioned my husband he did not understand. And it prompted me even further to ask how I appeared to people and how they perceived me. I wondered if I looked pathetic and in need-of help. I don’t mean all single mothers are in need of help, but I wondered if I seemed like a single mother, so pathetically going through suffering. I was not even dressed provocatively; it is winter in Melbourne, so bone-chilling cold and I was wearing a thick feather jacket and ‘double’ pants. But of course, when you need something, you must dare to ask, for, you never know wherein a positive answer lies for you. It was in June last year, at the peak of winter that my family and I landed in Melbourne. The Intensive Academic Program that the AusAID scholars undergo for a month is honestly intensive. As is the purpose, it makes us understand what we will be expected to do as a master’s student and how we must perform the assignments. Having to attend the classes the next day I have been flown here, I felt totally disarrayed – more because I suddenly had to leave my 5 month old daughter at home for the whole day. It was a big change. A big change indeed. As part of this introduction course called the IAP, we had to conduct a short survey. This was a group assignment. We were going to pick our respondents randomly – from the park, in the train, at the restaurants, at the hospital etc. I didn’t realize that it is really, really hard to get people to agree to be a respondent. When number of people who said ‘no’ outnumbered the ones who said ‘yes’, I felt totally dejected. I even cried, every time they said no. It was a very new experience for me. In Bhutan, we have people agreeing to your request all the time (almost). And it did not occur to me that people could refuse your request without any tinge of emotion. After a while, I just feared to approach anyone. I think I made do with just 8 respondents. Later during the presentation, I found that in fact our group had the maximum respondents and ours was the longest survey. We surely must have pressured ourselves beyond the scope of the assignment – or we wanted to be the best. But anyway, the point is that, here, in Australia (must be like this in other countries too) you have to pay people if you want them to take part in your survey. There has to be some incentive or they won’t take part. The way people calculate each second of their time in terms of money is crazy. I mean, I still can’t come to terms with this idea. How can everything be calculated in terms of monetary value? Aren’t there things that are equally important or rather, more important than money? Out here, I am starting to see that a human’s life is valued based on the list of skills they have and the amount of money they make. Exactly! Today, in one of the classes a lecturer told us that if you are more expensive (your hourly rate, if you are to be hired as a contract employee), then people tend to believe what you say more easily. In many ways, the course is teaching me that all the principles I held all this time has to fall away, because everything is a process of politics (it should take a different topic on its own. I will write on it soon). But my point for today is that, as a Bhutanese, we are taking so many things for granted. For example, even when we conduct surveys, we tend to think that people are actually obligated to be our respondents. These days, everywhere I read, I see more people complaining about what we don’t have than being grateful about what we have. I think, while it is good to be critical, it is worthwhile to appreciate what we have. I had just become a mother and I was home all day, every day with my baby. I was overwhelmed by love one could feel and surprised by how different it is to just knowing something and experiencing it. I have only known and heard that mothers and children share a very strong bond and there I was, experiencing it for the first time and feeling joyful at this blessing that life offers. This love is like this: every time my baby cries, I feel the pain. Every time she falls sick, it worries me beyond reasonable extent. Every time she does not eat, I think she is not well. For the first time, you become so observant. You notice even the small changes in your baby’s behavior and every time you think there is a slight change from the normal routine, you worry that something must be wrong. On one of those days when my baby and I were simmering in the sun light filtering through the window to our bedroom in December in Thimphu, (one of the coldest months), I heard a mother and a kid having some sort of argument outside. The mother shouted at her child and the child cried – wailing in that heart wrenching cry that tears your heart. The second your children cry like that, you regret everything you have said or done. I felt sorry for the child and I wondered how his mother could scold him so much. And this morning, I had a similar incident and I come to realize that such incidences are unavoidable and you could be angry and shout at your children, however unintentional. My daughter is suffering from cold. She did not sleep well last night. I wanted to make sure that she was wearing warm clothes and her cold did not become worse. But for some reason, she just did not want to wear her jacket. She cried throwing away the jacket every time I tried putting it on. I got frustrated and shouted at her, talking to her as if she would see my point. And then she cried the agonizing, pitiful long-tune cry, tears streaming down her cheeks, making me regret everything I said. I sighed tired. I realized how challenging motherhood is. Despite all the joys, there are times when you wish you could swing your hands and walk out to the city for shopping without that nagging feeling of worry you foster in your mind all the time (the worry such as, is my baby fine? Has she eaten? Did she sleep? sit at the back of your mind all the time once you are a mother). You want to eat a sumptuous meal with your friends without having to ask your children not to disturb you. The joys outweigh all these because these are minor, unimportant things you could so easily sacrifice. But at times, such things can mount up so high, testing your human patience. I enjoy the crazy moments of being like a child again, playing with her, singing at the top of my voice in the crowd, jumping around and making funny faces but the continuous demand can be so strenuous. But at the end of the day, you forget those small frustrations. As soon as your child looks at you with that imploring looks, your mood lifts up. Walking this journey of motherhood, watching my daughter grow up, waiting for her to talk, imagining the times we will have together, going shopping and telling stories, I remember my mother so vividly and reminds me of how lucky I am. I then understand that in our life, everything happens for a reason and we must pass the small tests that life sets for us to have the strength to smile.